Restaurants looking for clean, modern design for their dining chairs and dining tables have turned to Direct furniture for over 10 years. 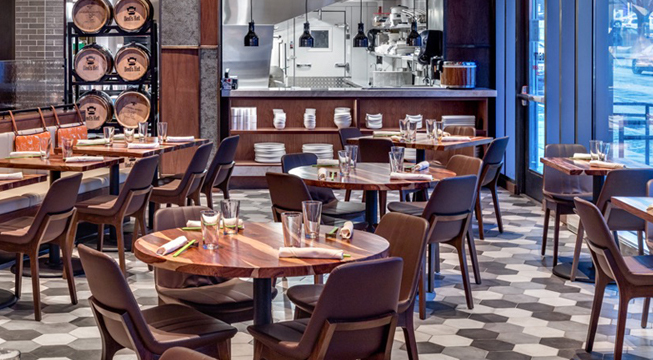 Direct Furniture offers a wide selection of modern seating and tables for restaurants. Why Direct Furniture for Restaurant Seating and Tables? Direct offers Trade and Volume discounts that make purchasing your commercial projects competitive and affordable on a wide range of modern furnishings. Direct represents National Brands offering a wide selection of Modern Furniture, Commercial Furnishings, Restaurant Seating and Tables and more. It's easy to find exactly what your next project demands from our wide selection of modern furnishings and lighting. Individual project manager assigned to your account. An individual Project Manager will be assigned to your project. Only one name to memorize, one email and one phone number to call. Your Project Manager will keep you informed, assure your questions are answered and help keep your project one time. Your deadline is our deadline… Your project manager will monitor your order and expedite to meet your deadline whenever possible. If we can’t meet your deadline, we’ll inform you right from the start, providing you an honest estimated delivery date. Should anything change along the way we’ll keep you informed and provide you available options.